In a Young’s double slit experiment, the separation between the two slits is d and the wave length of the light is λ. The intensity of light falling on slit 1 is four times the intensity of light falling on slit 2. Choose the correct choice(s). (A) If d = λ, the screen will contain only one maximum. (B) If λ < d < 2λ, at least one more maximum (besides the central maximum) will be observed on the screen. 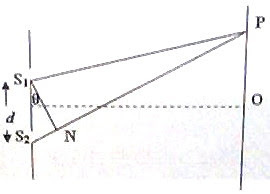 (C) If the intensity of light falling on slit 1 is reduced so that it becomes equal to that of slit 2, the intensities of the observed dark and bright fringes will increase. If λ < d < 2λ, the limiting values of d are λ and 2λ. In addition to the usual central maximum, fringes of order up to n satisfying the equation, dsinθ = nλ will be obtained, where d < 2λ. If d = 2λ, we have 2λ = nλ/sinθ so that n = 2 sinθ. Options C and D are obviously incorrect since the intensity of the dark fringes will become zero when the light beams passing through the slits are of equal intensity. The dark fringe of order 1 (1st dark fringe) is formed when the path difference is λ/2. The dark fringe of order 2 is formed when the path difference is 3λ/2 (and not 2λ/2) and the dark fringe of order 3 is formed when the path difference is 5λ/2 (and not 3λ/2). Generally, the dark fringe of order n is formed when the path difference is (2n – 1)λ/2. The 6th dark fringe is therefore formed when the path difference is 11λ/2. By clicking on the label ‘wave optics’ below this post, you can access all related posts on this site. You will find useful posts on wave optics here at apphysicsresources. You will find many questions involving moment of inertia on this site and you can access all of them by clicking on the label ‘MOMENT OF INERTIA’ below this post. I give you two more questions here, the first being the one which appeared in the AIEEE 2008 question paper. You will have to apply the parallel axis theorem to answer these questions. ICM = m(a2 + a2)/12 = ma2/6. [Note that generally for a bar of rectangular cross section, the moment of inertia about an axis passing through the centre, perpendicular to its length is m(l2 + b2)12 where l is the length and b is the breadth]. 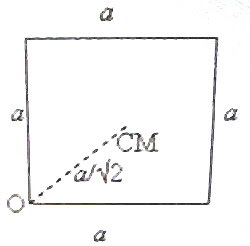 I = ICM + m(a/√2)2 since the corner is at a distance a/√2 from the centre of mass (fig). 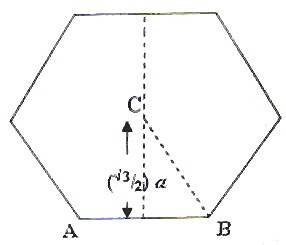 (2) A thin uniform rod of mass 6m is bent to form a regular hexagon of side a. 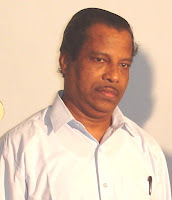 What is the moment of inertia of the hexagon about an axis passing through its centre and perpendicular to its plane? I = ICM + m[(√3/2)a] 2 since the side is at a distance (√3/2)a from the centre of the hexagon (fig). Thus I = ma2/12 + 3ma2/4 = 5 ma2/6. Since there are six sides, the total moment of inertia of the hexagon is 6×5 ma2/6 = 5 ma2. 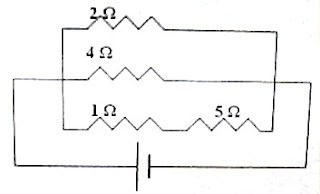 Since the current through the 4 Ω resistor is 1 ampere, the potential difference between the points P and M is 4 volt. The 1 Ω resistor and the two parallel resistors (each of value 0.5 Ω) make the total resistance in the branch PNM equal to 1.25 Ω. The potential drop across the 1 Ω resistor is therefore equal to 4×1/1.25 = 3.2 volt. The potential difference across the 2 Ω resistor is 2×3 = 6 volt. The same p.d. appears across the branch containing 1 Ω and 5 Ω. 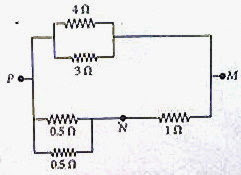 Therefore, the current through 1 Ω and 5 Ω is 6 V/6 Ω = 1 A. Therefore, the power dissipated in the 5 Ω resistor is I2R = 12×5 = 5 watt.